This is the result of the third day of work on the goldfinch miniatures. I now understand why Alkyds are a good way to start. The slow drying time of my oils has prevented me from working very long on these two pieces. I also have learned a valuable lesson about the sanding film that is used between coats. I am afraid I went at it too hard on the first layer and the film left scratches in the painting that are horrible when viewed under the magnifier, although they are not noticeable with the naked eye. All the same, in the future I will be very sparing in the use of the film and I will try a circular motion rather than the back and forth buffing motion I used. 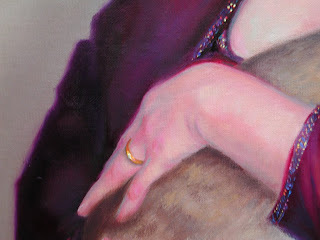 You can see that I am very slowly(excruciatingly slow) building up the colors in the painting. Instead of jumping right into black on the finches, I have used a bit of Burnt Umber and I have indicated the feathers by a wipe out method I saw Joan Willies use. Very effective! I love detail and have had to restrain myself on the finch eyes. I really want to put that little dot of light into the eyes already. Patience Linda, Patience! This is the Christmas Gift that I gave to my son this year. 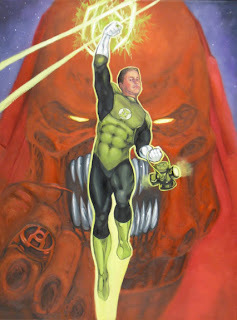 He has modeled for me many times and has always been a favorite subject for my brush and his father suggested that I do a painting of him as the Green Lantern for his Christmas Gift. My son is such a huge comic book collector and Green Lantern is a favorite of his. He also collects comic related collectables. The painting is an 18" x 24" oil on Linen gallery wrap. I used a cover from one of his favorite comics and then inserted his head. I had no idea that I would enjoy doing this so much. I am pleased that I was able to do his likeness in a comic art style. My son was totally blown away with this gift. I had feared that he might think it goofy or a dumb idea. But as always, my husbands' ideas are a big hit. The painting will be on loan to my gallery for a while and I am hoping to get a few commissions to do some similar works for folks. My son even has suggested that I send my portfolio to the comic houses or maybe even develop my own comic characters. HMMMMMMMM, sounds like a fun thing to try. Can you believe this is my very first gingerbread house? I stopped in to see my good friend Jeanne on her birthday and to drop off a small present and after a while she informed me that my Christmas present was a gingerbread house, but I had to make it myself. Jeanne makes gingerbread houses each Christmas with her two little granddaughters. I had told her that I had never made any in my lifetime and felt very deprived. So she prebaked the gingerbread and assembled the walls and roof. On her kitchen counter were the icing and decoration pieces, little candies of all types and the essential butter knife. After a few short hours of serious artistic endeavor and much laughter and coffee breaks.....TA DAAAA, my very first gingerbread house. The big joke that day was that my house was handicap accessible, complete with handrails at the front door. I am pushing on inspite of the infirmities of old age. I already had a glass garden cloche which I washed up to cover and protect my totally edible sculpture from the five cats we own. Oh and the boxer, Molly who is in the photo background eating her dinner. 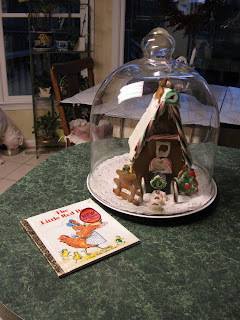 The little golden book, "The Little Red Hen" was also part of my Christmas gift and is a private joke between us gals. 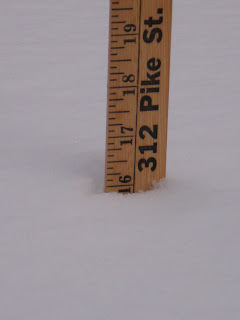 OK...I survived the blizzard of 09. 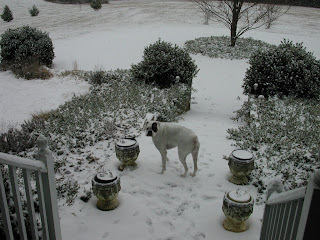 Here are photos taken on Sunday morning before we dug out. 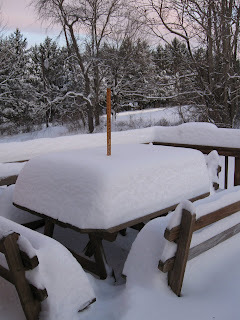 We had 16 inches on our picnic table and that was where the wind was blowing....so you can imagine the snowdrifts in our driveway and at the mailbox. I spent the day working first on the miniatures you see here and on a Vanitas painting I started a while back and put aside when I became busy with other more pressing projects.....ie. the miniatures show. I am working on two small pieces of ivorine that I cut to fit frames. They are taped to some foamcore and beside are two photographs of goldfinches that were feeding on my back porch sunflowers. My dear Aunt, Judy Adams of Roanoke Virginia took these photos of goldfinches from inside my kitchen. She is amazing with a camera. One of the paintings will become a thankyou note of sorts for my Aunt. It is near whiteout conditions outside and I am going nowhere today. 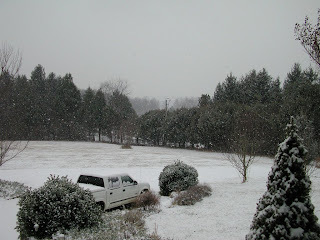 I will post some pictures later on of the blizzard we are having. 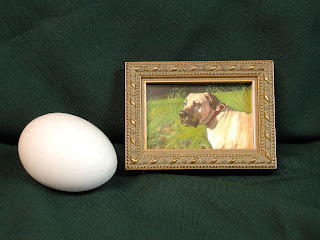 I am actually going to attempt to paint a miniature painting today. I have procrastinated as long as I possibly can, but have no excuse today since I can't go out anywhere and I have all sorts of new equipment and supplies to work with. I suppose I am afraid of failure, which is why I have not attempted this sooner. I will post some step by step pictures shortly. By the way, I saw a fabulous free demo by Joan Willies at the Strathmore show put on by the Miniature Painters, Sculptors, and Gravers Society of Washington DC. I will attempt to do as Ms Willies instructed, which reminds me of working with porcelain painting techniques. I just learned this week of the passing of William Whiting. Bill was an extremely talented plein air artist from the Winchester area and was represented by Caulfield Gallery in little Washington, just up the street from my shop. Although we were only acquaintances, running into one another at the various local shows, I feel a great sense of loss. He was "my age" and often spoke kindly of my work. 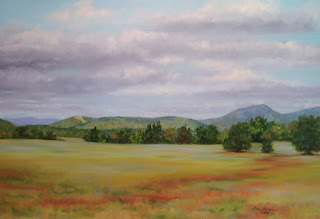 The real loss is that his plein air paintings were usually of our area out here and showed a real sense of place, caputuring the true beauty of the blue ridge and surrounding piedmont regions. His works were definitely among the masters of plein air painting. The art world has lost a great artist. Merry Christmas from the Ice House Gallery. Little Washington is just beautiful at night during the holiday season. I am absolutely in love with the historic setting and decorations this time of year. Its almost like living in Williamsburg on a Miniature level. Speaking of miniatures......my New Years Resolution this year will be to become an accomplished miniature paintings artist. I am currently designing next year's Christmas Card....something I have had in mind for a long time, but just never had the time to do it. Amazing how much time I have for art, now that I am in a studio away from my home. I would like to say thank you to all the kind artists who have sent me cards and e-mails recently, to let me know how much they liked the 1st Annual Little Washington Miniatures Competition. They all have mentioned how professionally it was presented and that the quality and success of the show was outstanding. One artist even gave me an A+ grade on my handling of the show. I can't wait to start on next years show. Be sure to come out on Sunday, December 6, 2009 for Christmas in Little Washington. The event is from 10 am until 4 pm. There will be a parade that day along with other happenings in town. Check out www.thefirstwashington.com for more information. Can you believe that at the exact spot where I hit Bambi a few weeks back, I came upon 12 to 15 young wild turkeys standing in the road just a couple days ago? They were crossing the road, some had started up the bank into the field, but were mainly just milling around like turkeys will do in the middle of the road. I had to honk my horn repeatedly to get them to move out of the road, all the while thinking that another car would pop up over the hilltop and slam into me and the silly birds. Don't they know its Thanksgiving and they should be in the woods out of sight? 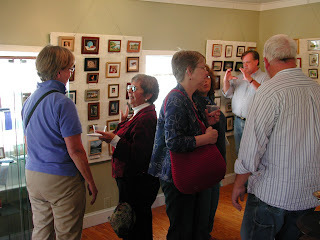 The Rappahannock Artist's Studio Tour this past weekend was an overwhelming success. Over 5oo tickets were sold on Saturday and then another 400 or so were sold on Sunday at the Washington VA Firehall. At the firehall, a gallery was set up so that ticket purchasers could preview the works of the artists before making their choices as to which studios to tour. It was so gratifying to have visitors tell me that they chose my studio because they wanted to see the artist who painted "Adonis-My Son" or "Vanitas #2". Highlights of my weekend included being interviewed by Virginia Living Television on Channel 16, Culpeper and Channel 17, Orange. But, It was the very young man and lady who came in on Sunday around 5:00 with their mother who made my day. They came with pen and paper in hand, prepared specific questions to ask me about art and the best comments of all. The young man told me he chose me to interview for a school report because I had the best art at the Firehall. This is why I paint. 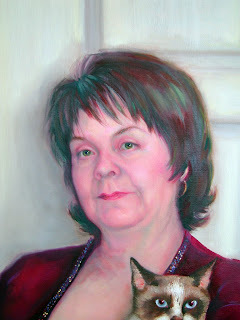 I also loved the wonderful comments about my mother's portrait as Gaea, aka Mother Nature. 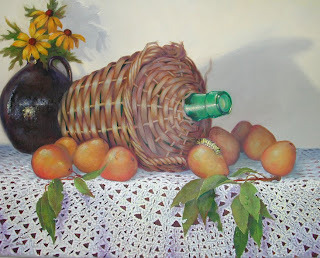 It is a wonderful feeling to know that you have delighted people with a whimsical painting. I am so tired from all the talking and standing I did this weekend, but I can't wait for next years' tour. It was a fantastic experience. I just received my November 2009 issue of American Art Collector and featured in the magazine this month is a section about small works and Miniatures. There are some fabulous images in this section of a few of the artist's whose works sold at our exhibition. The 1st Annual Little Washington Miniature Painting Exhibition has been a greater success than I had anticipated. Even in a recession economy! Seventy artists from all across America submitted artwork. We hung 183 pieces of art and we sold 28 pieces, which is 15%. Not too bad for a first endevor. The quality of the art was outstanding. The Senior Editor of the Piedmont Virginian Magazine was so impressed when he attended the reception, he has decided to do a feature article for the winter issue about the miniature artists of the Piedmont. Look for next years exhibition to be bigger and better! 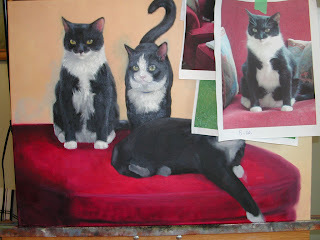 Here are final photos of the completed commission of the Tuxedo Cats, lovingly referred to as The Boys. As you can see, cameras don't always tell the truth. The photo on the left has better detail and less reflection from the shine of the oil paint, but the photo on the right is more accurate in color. The actual background is a beige, not yellow. The Ottoman is actually a burgundy or maroon color, not orangy red. 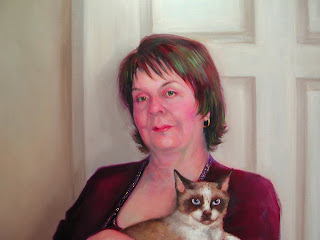 Anyhow, the client has picked up the painting and loved the end results. My greatest fear is that a client will not like anything about a painting I have done for them. I always expect a minor tweak or two, but have not yet encountered a totally unhappy client. I finally got the new camera up and running. I am slowly getting comfortable with all the new features on this camera. My old one did very little other than shoot pictures since it was purchased the year that digital cameras first came out. My husband has always loved photograpy and has had many cameras. He was the one who just had to have digital. I am such a Dinosaur and slow to embrace technological advances. The Foxhound's Dream copy is nearly finished. Just a few more minor things to do and it will be completed. Last night as I was coming home from the gallery, I hit a very large deer. A doe, I believe. She came out of nowhere and there was nothing I could do. CORRECTION, there was plenty I could do and I did it just like the driver safety manuals tell you and so today I sit here typing out this blog instead of ending up in the emergency room of our hospital. The doe jumped down off an embankment on my left just a few yards in front of my car. I had very little reaction time, but what I did and did not do, saved me from worse damage and injuries. I hit the brakes hard, grabbed they wheel like I was clinging to a cliff and braced myself. Instead of trying to avoid the deer and driving off the road, I aimed for her. Please don't try to avoid the deer.... there are worse things waiting for you on each side of the road, such as huge boulders, trees, barbed wire fences and deep embankments your car could roll down and flip over. As it stands now, I have no injuries other than some back stiffness and my car damage does not look too bad. It is still driveable, but the insurance adjuster will tell me more soon. This time of year is the worst for deer related accidents. Its all about LOVE right now and those bucks have nothing else on their minds. The does are all excited and spring out in front of cars. Then the bucks follow blindly. Remember, where there is one deer, there are usually more following behind. My accident occurred at one of the most active periods of the deer's day also....dusk. They are really busy at dawn and dusk so be extra careful driving at those times of day. Also, your visability is diminished. So remember friends......"It's OK to Kill Bambi"
The 1st Annual Little Washington Miniature Painting Exhibition is a huge success and we still have two more weeks for this show at the Ice House Gallery. To date, we have sold 16 miniatures in just two weekends. We had a fantastic reception and per my husbands head count, 167 art collectors, artists, and Leaf Peepers attended the reception and gallery throughout the day. The Piedmont Virginian Magazine was so impressed, they will do a feature story on the Miniature Artists of the Piedmont. Not Bad for a first time show! 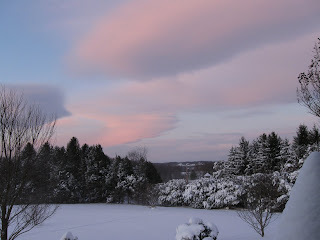 I just got a new camera and will start adding pictures to the blog again. My camera is unfortunately on the fritz, so no pictures this posting, but hopefully I will have it back to working shortly. 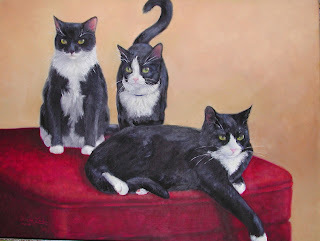 I think that today I finished the commission of the three Tuxedo Cats. I was not so sure myself, but my fellow artist, Geneva Welch, came in to visit and I asked her what she thought of it. She immediately said, You are finished, leave it alone. So I will contact the clients and have them look it over. By the way.......the trees are beautiful in Little Washington and the weather was absolutely perfect today. Yesterday was once again absolutely perfect weather for a plein air workshop. The mountains were starting to show some color, skies were clear with those occasional Fall wispy clouds high in the sky and low on the horizon. There was a bit of a chill in the air which quickly turned into the perfect temperature. I demonstrated a view in pastels and we all worked the day on our own views. 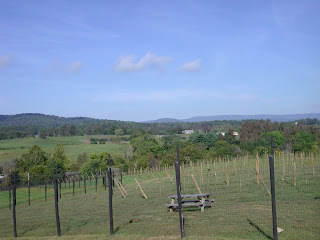 The hilltop patio at Barrel Oak was quiet except for the occasional bird calls. By the way, we did not see our bald eagel this time. In case I forgot to tell you, at the last workshop a lone bald eagel flew over head and circled our area a good long time. Everyone at the vineyard stopped what they were doing to watch this majestic bird. Although we did not see our eagle friend this time, we did see the fattest ground hog ever running across the hilltop. We of course did tastings again and then shared a bottle of wine during our lunch. This was the last workshop for 2009 and I will resume the workshops in the Spring when weather is warm again.............I don't particularly like cold weather. 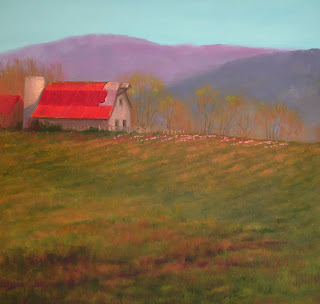 I am honored to have my image "Tarara View", included in the Autumn 2009 edition of The Piedmont Virginian magazine. It is on page 41 along with a few other artists as part of an article about the upcoming Artists of Rappahannock Studio and Gallery Tour. The tour will feature 50 professional artists during the two day event. So mark your calendar for November 7 & 8, drive out to the fire hall in Little Washington, pay your $10 admission and then you can get your map and tour the working studios of Rappahannock's gifted artists. The photos top to bottom are of the Mitchells pouring tastings, Narissa Steel speaking with fellow artists, and yours truly greeting guests. Saturday, October 3rd was a perfect Fall day. Crisp and clear and at the perfect temperature all day. It was one of those days that make you feel young again. As you see artists and art patrons were happy to sip wine and nosh on cheeses and other delicacies in the open air, while others were arriving to view the spectacular show. Thats me behind the sign, glass in hand, greeting our guests. The final count of visitors that day was 167 attendees, artists and collectors alike. Our esteemed judge, Narissa Steel talked shop with attending artists, and told me that miniature artists all started out as big painters. She is the lovely lady in the wine colored jacket. It was such a pleasure to have Nar judge our show and then to talk art with us at the reception. Fellow artist Geneva Welch told me that it was such a delight to meet all the other artists and talk shop for the afternoon, something we artists need more of since we have such solitary professions. And to make the day extra special, our very knowledgeable wine enthusiast friends Jeanne and Mitch Mitchell were pouring for our generous sponsor, Barrel Oak Winery. Barrel Oak is located off Rt. 66 between Delaplane and Marshall in Fauquier County. Can you believe summer is almost over? Fall is just around the corner and so is the 1st Annual Little Washington Miniatures Painting Exhibition. 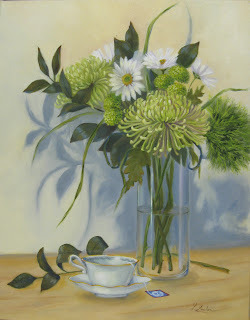 This show is a national competition with cash prizes and is being judged by Narissa Steel, President of the Miniature Painters, Sculptors and Gravers Society of Washington DC. Plan to come out and be totally amazed by the beauty and technical skill of these tiny paintings all smaller than 25 square inches in size. Currently on display at the Ice House is "Raining Cats and Dogs". 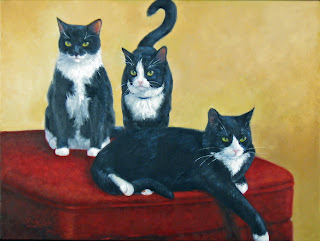 All the artwork is of cats or dogs by a few Northern Virginia artists who are tops in the field of animal art. take advantage of the 20% discount on artwork until Labor Day. 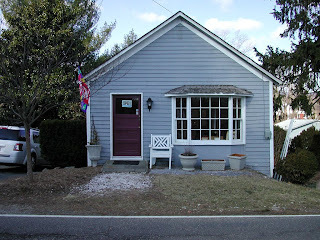 If you aren't staying at a B & B, just mention this blog and receive the discount also. 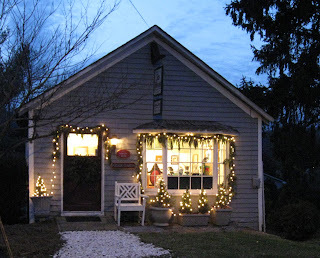 The Rappahannock Artists Studio Tour will be on the first full weekend of November. This tour just gets better and better each year. 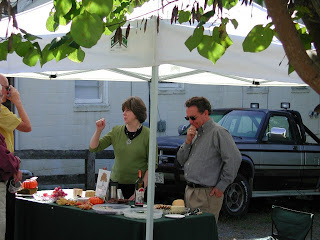 Plan on taking the tour and see the working studios of all your favorite Rappahannock Artists. Jack Nicholson recently visited Little Washington to have dinner at the world famous Inn. Unfortunately for me, he came out on a Wednesday night and I am closed on Wednesdays. Hey Jack, you missed out on some fabulous artwork at the Ice House Gallery. 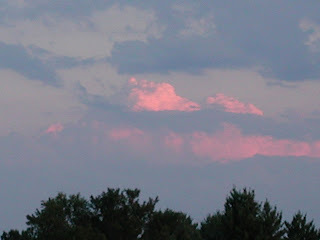 This is a photo taken in my front yard one evening. This is just the sort of thing that inspires a painting for me. I will hopefully get one started this week. Maybe a little study first, then incorporate this into a larger painting. Remember the Robin building a nest outside the studio door? Well, she has disappeared during my three day closures after her initial three day sitting on the next. Why? I have no idea. She simply left after three days and never returned. I can't imagine what possed her to build in that spot to begin with. This is the beginning of a painting called "Cresthill View". I pass this spot each day on my short commute to the studio/gallery. 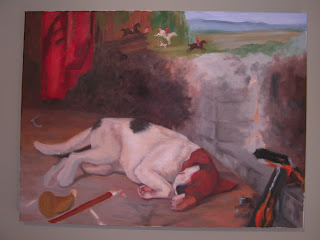 I am thinking its time to add some animal life to my paintings and the foreground bothers me a bit. Not too sure why, but I will contemplate some changes to it. 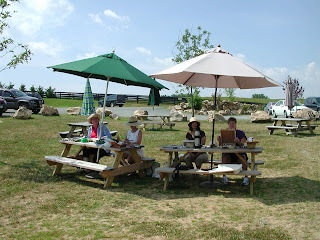 Here are two photos of my most recent Plein Air Workshop at Barrel Oak Vineyard and Winery. We had a fantastic view to paint, which included a bit of John Marshall's home among the distant trees. John Marshall was our first Chief Justice of the Supreme Court. His birthplace is just up the road also. You can almost smell the paint and see the smiles on the faces of the students. The day started off warm and breezy, but by 11:30 we were all ready for a free wine tasting and some lunch, provided by myself as part of the package. I did a demonstration in oils at 9:30 and then did a pastel demo after lunch. By 2:00 everyone was suffering from too much information for the brain to store and we called it a day. 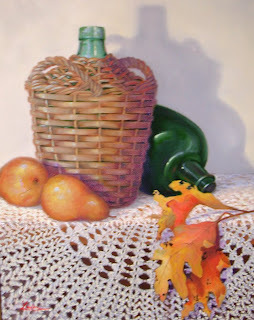 My next workshop at Barrel Oak is on September 23rd and then another on October 8th. Preregistration is required since a gourmet lunch and winetasting is included. Please call 540-364-4043 to register or send me an e-mail, sha45rps@starpower.net. Take two steps outside of my studio door and you are under a small redbud tree. I am 5'7" and have to bend a bit to walk under the low branches. 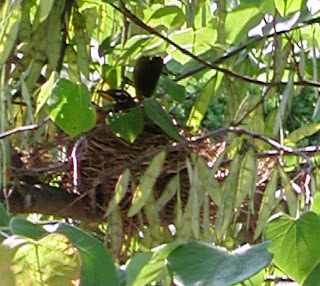 While I was closed on Tuesday, Wednesday and Thursday this Robin built her nest in the tree directly above my walk. I can actually put my hand into her nest and my OPEN flag flutters right in front of her face. What was she thinking? I am hoping the eggs won't hatch during the next three day period I am normally closed. Is Mother Nature or God trying to tell me I am supposed to paint animals instead of humans? Why else would they be throwing all this wildlife at me these days. Oh and we have a Doe with three spotted fawns living in our front wooded area. 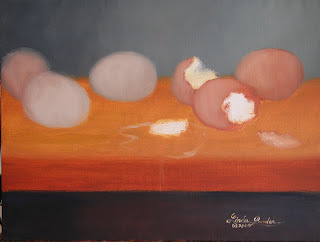 You can look forward to more pictures of the babies and a possible new series of paintings. 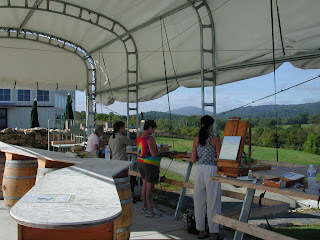 I will be teaching Plein Air Workshops at Barrel Oak Vineyard on July 16th, September 23rd, and October 8th. The classes run from 9 am til 2 pm. A gourmet lunch and free wine tasting is included, all for $55.00 per class. Preregistration is required. Contact me at 540-675-3039 or 540-364-4043 to register. All levels of skill and all mediums are welcome. This is a $150.00 value for only $55.00, and you get to see the most beautiful scenery in all of Virginia. 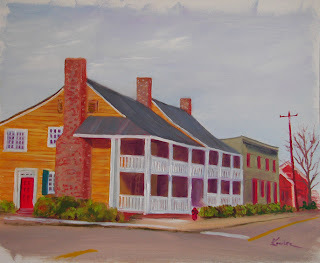 This small 5" x 7" study is of Mrs. Cox's Tavern, which is at the corner of Middle and Main Streets in Little Washington. 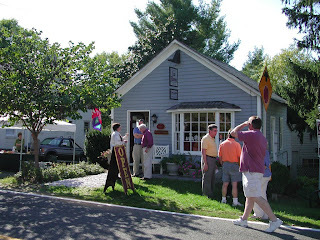 It is now the Inn at Little Washington Gift Shops. This study is oil on a piece of gessoed bristol board. I have started doing these studies in order to determine if I am excited enough about the subject to do a larger version and to work out the composition and color. I don't think this is the painting I was looking for......some sunnier colors would suit the subject better, so I will wait for a sunnier day and try it again. By the way, my small studies are for sale in a mat for $150.oo. Contact me at 540675-3039 or at sha45rps@starpower.net. This blog thing is hard!!! Life happens and then you realize it has been a week since your last posting. We now know I am not and never will be an equestrian artist. And although I have painted foxes, thats not my true calling. I am often in Washington DC at the National Gallery of Art and I am always exhilarated by the city hustle and bustle, the sounds and smells and in general, the exact opposite of where I choose to live. But, for me to paint cityscapes would be a real mistake. I am and always will be a country girl. Dirt under my nails, quiet country noises of the birds and crickets, and rural vistas are what define me. 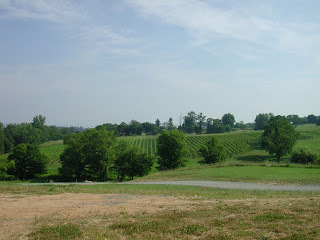 I am so motivated by a dilapidated barn or a vineyard vista. The Blue Ridge Mountains are visible from my front porch and I can pick my own vegetables each year from my back yard garden. Oh, did I mention that I canned 40 quarts of tomatoes the year before? No, I am not a painter of Urban sprawl or city scenes. Neither am I a plein air painter, although I do it from time to time. But, I am indeed a landscape artist in much the same manner as Parrish, Church and Cole were landscape artists. I love the landscape and am often outdoors. I have hiked a few trails, done my share of camping and white water rafting. Indeed, I do love the landscape and landscape painting, but only from the warmth of the studio, field notes and glass of Merlot in hand. You don't have to pick flies out of your paint that way. This is the finished painting after another five hours work on the finer details. I think the clients were happy with it. While working on it, a couple came into the gallery and commented on how beautiful the brown shells were on the inside area. I was pleased with the dripping egg white. I love to paint slippery and shiny stuff. This is the end of day two. I actually worked on this for about three hours, not an entire 8 hour day. Notice the signature is already there. I have received critism for doing this, signing the painting before finished. But, I once had dozens of unfinished paintings stacked around my studio. I know it sounds silly, but I have found that when I put my name on it, the painting gets finished. I usually have three or four paintings going at the same time and this actually helps me to finish what I start. This is day one, the block in, of a small commission I recently finished. 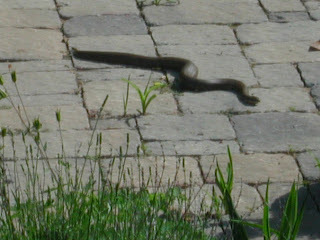 Here are photos of the watersnake that devoured most of my fish. We don't know how long he was in our pond, but judging from his size and the loss of fish I noticed each day, I surmise he had been in the pond area only three or four days. Last night at dinner, I spotted him entering the pond again and Brett sprung into action. He ran outside and grabbed the lily pad trimmer, a long aluminum pole with a blade mechanism on the end for cutting or grabbing lily pads and spent blossoms. With amazing stealth and agility, Brett managed to put the blade around the snakes' neck and grab and pull it out of the pond. I stood by with the garden shovel and together we chopped off the snakes' head. All our pets excitedly watched. They all knew the snake was around for days and I would see them sniffing the area excitedly each day when I would let them out of the house. As you can see from the photos, the snake is about 3 patio blocks long, stretched out. Each block is 12 inches long, so my snake was 36 inches long and he was almost as thick as my forearm. Fortunately he was not a poisonous snake. The sad news is, when Brett held him up to throw into the woods, there were two large, fish shaped lumps in its' tummy. One of those lumps was Moby, Brett's favorite fish. Moby has been in our pond for 10 years and had reached a length of 8 inches. Moby was the very first baby born in our pond from our originally purchased goldfish and Moby was solid black. We lovingly called him our "Stealth Fish" because you could not see him easily in the pond. Mental Note: Paint a memorial painting of Moby. On Monday while I was working on some raspberry studies, a smallish black bear came running past my gallery window on Main Street. Seems the young bear had come into town looking for bird feeders and then became frightened when he ran into some folks in town. Shortly thereafter, the animal control folks came by in pursuit. Later the same day, three families of Canada Geese came strolling down Main Street with about 16 young goslings following. I was so excited to tell all my city friends about the day when I was at The Art League yesterday. Would you believe, I went out to my fishpond this morning with coffee cup in hand just before sunrise. I was surprised to find a water snake in the pond having a big helping of my largest goldfish. 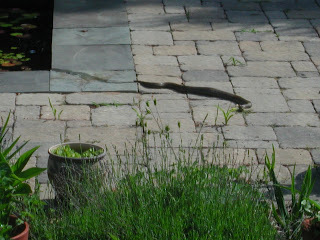 He came out of the pond as soon as the sun was up and warming the flagstones and he slithered into my yucca plants. I am sure he will return for another meal in a day or so. Until then, I have to figure out how to be rid of him. I also need to identify whether or not he is poisonous. Picasso & I Finished ? Finished at last....well almost finished? I think my photography skills are improving, but I still have issues with the eye on the left side of the painting. How about those moist lips? I am very happy with the hands and of course, Picasso is perfect. Some folks who came through the gallery the other day, commented on the nice sparkly effect of the beads on the dress top. I am most proud of the way I have finally learned to soften my edges. The only thing that could make this better, is if I were to remove 60 pounds and give myself a facelift. Ahhhh Vanity! Picasso and I is almost, maybe finished. I will photograph it today and post it tonight or tomorrow. I still am having one issue with it and will probably always have an issue with it. I find that I just can't be totally honest with myself when it comes to self portraits. I just may, (not that I am comparing myself to Davinci) keep working on and carrying this portrait around for the rest of my life. 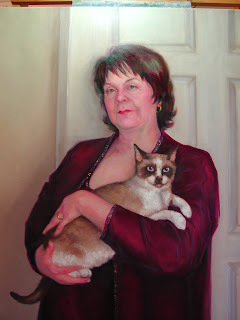 Maybe we will rename the painting the, Mona Lawler. Shall we vote on this? On April 15th, Tax Day, I drove past this barn on my way to the studio. This barn is on Cresthill Rd. just outside of Flint Hill and I pass it every day on my way to the studio. It makes me a bit sad to see it is deteriorating rapidly. I wondered this morning if it had to do with families in the farming community who can't pay their taxes or in general the current economic situation. Mental note.........I should paint this barn in all four seasons and various types of weather. Here is the final painting of my grand opening flower bouquet. It started as a small study and I loved the colors so much, I decided to do the entire bouquet. These incredible flowers lasted an entire month. This is the type of painting I call decorator friendly. It is a simple color scheme and you can build an entire room around this painting. It was fun to do and actually helped to loosen me up a bit. I have just received notice that my painting, "Vanitas #2" has been accepted into the Salmagundi Club 32nd Annual Juried Painting and Sculpture Exhibition for Non-Members. The show is at the Salmagundi Club, 47 Fifth Avenue, New York City, from June 29th through July 10th. 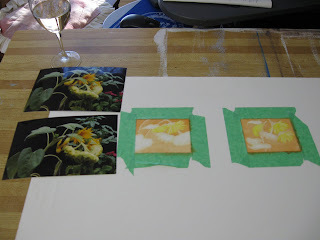 In my efforts to become a more focused artist, I have been doing little studies on bristol or art board that I gesso. They are usually 5 x 7 or 7 x 8 1/2 inches. This is how I determine if something warrants a larger painting and if the composition is good or the idea exciting. 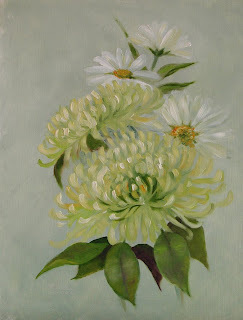 This little study is of the flowers I had at the grand opening of the Ice House Gallery/Studio in March. These incredible flowers actually lasted a month and I was able to do the study and then the actual 20 x 16 painting before they withered and died. The colors were so intriguing, I had to do them in a large format. I am offering my little studies to the public through my gallery/studio for around $125 matted. They are selling really well. I have also had three requests from visitors to the gallery to see the larger painting as soon as it is finished . After the three requests are honored, I will post the larger painting to this blog. I am absolutely going to take some photography classes. I worked on the cheek and lower jowl area of the lit side of the face. Not my best feature. Oh Vanity! I also played with the door a bit, since I thought the value was a bit dark. I saw a beautifully painted door in a painting done by ?????. The artist is a teacher at Studio Incaminati and I wrote the name down somewhere. Anyway, you can see the painting in the current literature the school is sending out. I am still searching my soul, looking for that one thing that I love to paint. 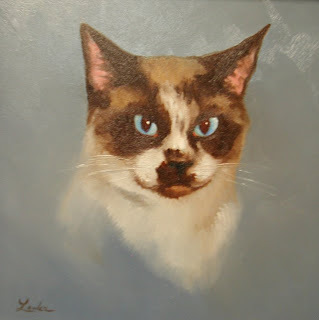 We know how much I like to paint cats and dogs as evidenced by the numerous cat and dog studies and paintings I have stacked in my studio. Hopefully in August my show at the Ice House Gallery, "Raining Cats and Dogs" will result in a reduction of these recent pieces. Over and over again, well meaning friends and family have suggested that I should paint horses, foxes, and foxhounds, because of the area I live in. Very Big equestrian market here and foxhunting groups abound. But, I feel no real affinity to those subjects and one thing I do know......an artist should paint what they know or can see. I could not tell you the difference between a feltlock or a whither, so how could I possibly paint one expertly? Off to work now, More thoughts tomorrow. I had the pleasure of hearing Mary Whyte speak at the Cecilia Beaux Forum last week. Since then, I have been in such a quandry over one point she made. Ms Whyte directed us to sit down and decide what it is we most love to paint. She said that if you paint what you truly love, it will show in your work and your progression as an artist. Your growth towards the goal of being a master artist will be impeded if you paint what is fashionable or uninteresting to you. Now I must decide what it is I truly love to paint. That one thing I must paint to be happy with my work as an artist. I can honestly say, I don't know what it is. It may be easier for me to figure out what it is I don't like to paint or have no interest in. I don't care to paint en plein air.....I hate bugs and am very sun sensitive to the point I get very ill with too much exposure to the sun. But, I do love landscape painting. I often paint vineyard scenes based on field notes and numerous trips to vineyards to do tastings. Such a hard job, taking all those field notes with wineglass in hand! I don't like to paint old cars or machinery and rusting metals. 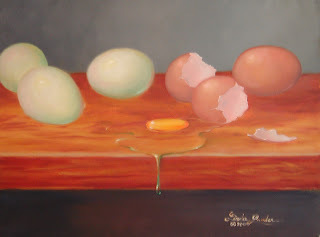 I do enjoy painting shiny objects such as glass, silver, gold and raw dripping slippery eggs. I am currently working on an egg painting and hope to have photos for you soon. I will think more on this subject and let you know where this train of thought leads me. I just received a question about the Burton Silverman slide presentation at the Portrait Society of America conference I recently attended. Linda H has asked what else he had to say about the use of cameras. to ok and justify projecting images onto canvas rather than taking the time to learn to actually draw. I wholeheartedly agree with Mr. Silverman's view that this is rubbish. Why bother to create art if you aren't going to learn to draw. You could just as easily buy a coloring book and some crayola crayons. We also saw numerous examples of artists creating works which were so wonderfully executed that one would think they were photography and yet they were not in any way created with lenses. If you have not yet noticed, I am a total clutz with computers. I posted a short note and a picture of a small study of my cat Picasso several days ago, before the Portrait Society Conference, or so I thought. Turns out it was in my drafts section still. So, I have just posted it for real and it is sandwiched in between other previous posts. Go back to around April 14 or 16 to see this one. I am not alone when it comes to being a clutz with technology. I thoroughly enjoyed a segment of the Portrait Society on Sunday morning, when Burton Silverman spoke and had some comical difficulties with the computerized projection equipment. Could this be an indication of my own genius laying dormant? Anyway, Mr. Silverman gave a very enlightening talk on the use of cameras and their impact or influence on portraiture. Thank you Mr. Silverman! I finally completed the third in my vanitas series. My intent is to pay homage to the dutch masters and do so in my own way by adding my own twist. Instead of dark and brooding backgrounds, my series will be lighter and higher key. I am pretty happy with this but thought the crochet table scarf would never be finished. When it was finished, I sat it aside and viewed it a few days, finally deciding that I needed to show one more sign of new life.....the catepilar. The symbolism for death is not strong enough in these first three paintings and I intend to strengthen that aspect in coming paintings. I am taking a few days off next week and attending the Portrait Society of America annual conference in Reston Virginia. I will come away with much new knowledge and be so energized. I find it amazing that a short conference like this can inspire me for months. I promise to take lots of notes and give you some great information over the coming weeks. I never tire of painting Picasso and so I spent some time yesterday doing this little study of him. It measures 8" x 8" and is oil on gesso board. I really need to improve my photography abilities. 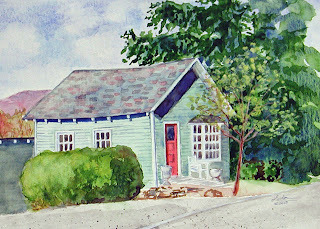 Visit www.icehousegallery.com to view and download a prospectus form for the 1st Annual Little Washington Miniatures Painting Exhibition. Due to be held October 2 through October 26th at the Ice House Gallery. All details are on the website and prospectus. Yesterday I celebrated my 57th birthday. More wrinkles to show for my life experiences, were duly noted that morning. I worked at the studio all day, which is what I love to do more than anything else. I came home to a sumptuous dinner and a brand new state of the art Margarita Machine from Williams/Sanoma. Also a card which said "All Things In Moderation" Not to worry, I am a very moderate individual. Next week I will spend Thursday, Friday, Saturday and Sunday at the Portrait Society of America Annual Conference in Reston Virginia. I am really looking forward to this event and am fortunate to live close enough to drive each day and not have to have hotel accomodations. I will have a friend sit my gallery while I am away. At the conference, I will renew some friendships, make a few new ones, and get totally re-engergized and motivated about my portrait work. It is an excellent conference to attend and so informative. I am registered to take the Drawing workshop with Edward Jonas and Anthony Ryder. 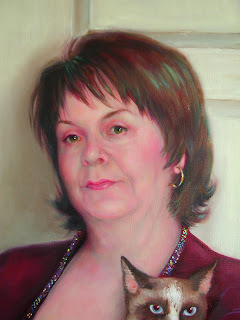 Both are tops in the field of portraiture and both are fantastic teachers. This workshop will be the highlight of the conference for me. I spent today at The Art League in Alexandria, helping with receiving for the monthly juried show. While there, I went upstairs to the offices to do some copier work for the gallery and happened to see a beautiful study by Kurt Schwartz in the conference room. The study was of a black German Shepard dog and it was stunning. 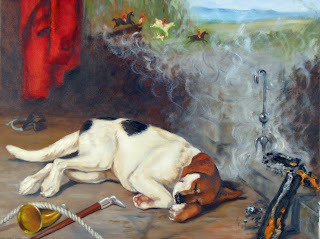 You can see life in the dog's eyes and I was mesmerized by the fluid beauty in his brushstrokes. This one painting convinced me today, that I will enroll in one of his classes very soon. Here is another view of the Ice House Gallery. Tres Chic! 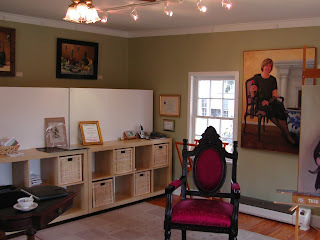 This view shows the sales counter and a corner of my easel is just in the lower left of this photo. The baroque red chair is for my male clients sitting for their portrait. The more femine chair was in the previous post. I am so totally focused when at the studio. Very soothing atmosphere to paint in. I spent all day yesterday working on the portrait of myself, especially the lower jaw and cheeks. I unfortunately forgot my camera. I will snap a few shots on Friday, since Thursday is my day off. Several folks, writters from San Francisco doing travel articles, stopped in yesterday and were quite interested in the portrait process. They were checking out the shops in Washington for an upcoming artcle. As promised, here is an interior shot of the new Ice House Gallery. I will show more shots later. My easel is located in the corner oposite this view and is positioned in front of a North Light window. Finally, North Light ! 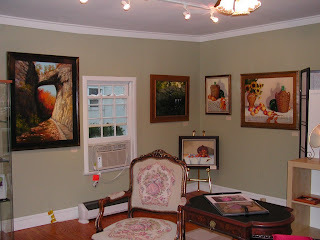 I could not ask for better lighting for the artwork in the gallery or for my easel up front. The grand opening celebration of Ice House Gallery on Saturday, March 14th, was a resounding success. Over a hundred attendees came out on a rainy, gloomy day to help me celebrate the new home of my portrait studio and we christened the gallery with a soiree par excellance. The day's festivities began with the first annual Saint Patricks Day Parade in Little Washington at 11:00 a.m. The parade route went down Main Street right in front of my gallery/studio. We all rushed outside at 11:00 and stood on the lawn of the gallery to enjoy the parade. Throughout the day gallery guests were served champagne and strawberries while they enjoyed the artwork and warmth of the gallery. Many of the visitors came from Washington DC and one very important couple drove all the way from Charlottesville. It was a wonderful day of seeing old friends and collectors and making new ones. I would like to pass on a special thank you to Monica Carroll and Jeanne Mitchell for all of their help and making the day so much fun. Also a thank you to Lorraine, the flowers are just beautiful. I do hope that if you were unable to attend, you will make a point of stopping in to visit when you are in Washington Virginia. As you can see, I am not a photographer, otherwise there would not be the flash reflection in the top and the door behind me would not look bowed. But, I am quite pleased with my progress. I think the likeness is really good now and my hair is not matching my outfit any longer. "Are you happy now, Ryan?" I still can't figure out why my work looks like a cartoon to me. I wonder if it is a flatness that I don't see until a picture is taken. I will work on that today. Sometimes I think I should have gone to work for Disney. Oh well, at least Picasso is beautiful. Why do I always learn the hard way? I just spent a year of my life and around $300 to learn that it does no good to join an online portfolio. I joined one a year ago, for illustrators. I heard a sales pitch from the sales person about how every major firm in the world who is looking for an illustrator, uses their online portfolio service. I also was told to be proactive in my marketing outreach and updating my portfolio. Believe me, I was proactive. I read in Art Calendar an article by Molly Crabapple, that also suggested this was a very cost effective means of generating more income and commissions. Guess what folks????? NOT A SINGLE INQUIREY OR RESPONSE came as a result. If anyone else out there has had a similar experience, let me know. And if by chance some of you had a positive experience, I would like to hear that also. I have had my website for over 7 years.....not one single sale as a result. Lets take a poll here. How many of you artists out there in cyberspace have had a sale as a result of your website? Lets all communicate and save each other some money! Ice House Gallery unofficially opened on Feb. 14. Guess who did not go out to dinner on Valentines Day? More photos to follow, since I am obviously quite busy with my new studio/gallery space. Isn't it just too cute? Today I started a new copy at the National Gallery of Art, as part of the Registered Copyist Program. It has been a year and a half since I completed my last copy, Sir Anthony Van Dykes' , The Virgin as Intercessor. I am currently working on Willem Claezs Heda's painting, Banquet Piece with Mince Pie. I have always loved the Dutch Masters and their Vanitas paintings and am finally getting to copy one. This should be a very educational experience for me and hopefully will help me to improve my own still life works. I am still dilegently working on the opening of my new studio and gallery space in Little Washington. Please come out on March 14th for my grand opening celebration. 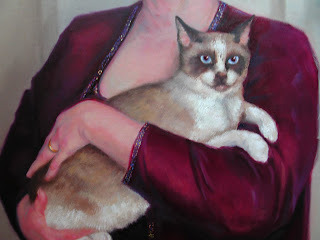 I am working feverishly to get my new studio and gallery up and running by March 1st. Obviously I am not getting much painting time in, but I have managed to paint and fire a few new pieces of china which I will sell through the gallery. 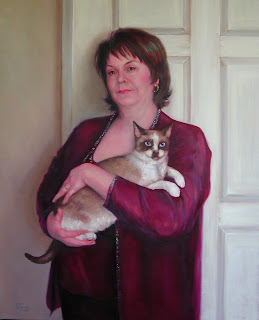 Its not looking like I will have an entry this year at the Portrait Society of America annual conference in Reston. I had hoped to finish my Picasso and I portrait in time, but I think it is best not to rush it just so I can have a new entry for this years' competition. I will vow to finish it and two others to submit for next years competition. Looking back over last years log of works completed, I can justify a bit of down time, since I completed 48 new pieces, 25 of them major works. 2009 promises to be better with my new space to help me focus.